The Defense Advanced Research Projects Agency — or DARPA — just launched a one-fifth-scale model of its LightningStrike aircraft for the first time. 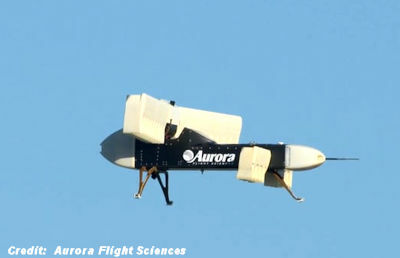 Built by Aurora Flight Science, the ‘Subscale LightningStrike’ relies on 24 fans to propel the 325 pound scale model and enable vertical takeoff and landing (VTOL). Not shown in the video, but planned on the full-sized version, is the ability for these propellers to rotate to provide thrust in addition to assisting in take-off and landing.